Login to your AddSearch account. This will show you your Dashboard. In your Dashboard you see the page quota for your plan, and underneath here it will say: “Earn bonus pages”. Click on it. 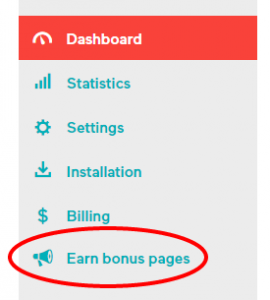 On the Earn Bonus Pages page, there is a list of the different ways you can spread the word about AddSearch, each of them giving you a reward of 25 pages. Simply follow the steps there, and get your 200 bonus pages! If you haven’t yet installed our script on your site, then do that first. Without it AddSearch doesn’t work on your site, and we are happy to give you 25 pages to do just that! We regularly update Facebook with news about new features, good tips for site owners and other relevant info. Happy with AddSearch? Why not give your friends the same opportunity? E-mail them about us through our field, and you can earn up to 100 free pages, 25 per e-mail. We regularly tweet and retweet all kinds of interesting info on site search, e-commerce, and other relevant things. Do you like AddSearch? Let your followers know, and we will reward you with 25 pages.